This seemingly never ending slog of tropical air and rain has produced another round of severe thunderstorms. 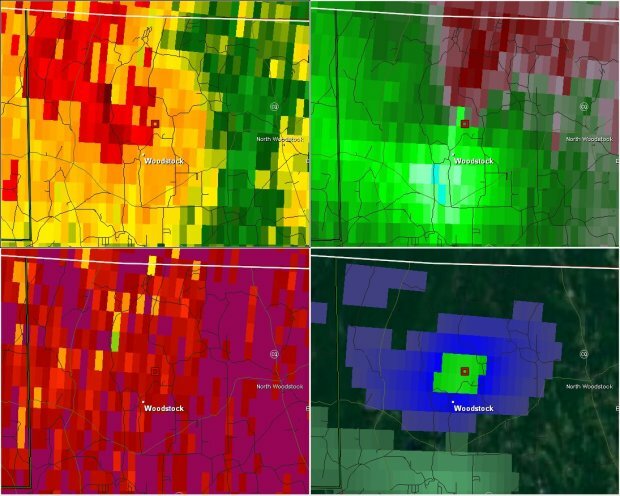 At least two tornadoes developed from a powerful supercell in Woodstock and Dudley, Mass. The damage was thankfully quite minor in Connecticut with only a handful of snapped trees in Windham County. The tornado damage was only evident in two corn fields in the western part of Woodstock where a convergent pattern of downed corn stalks was detected by the National Weather Service. 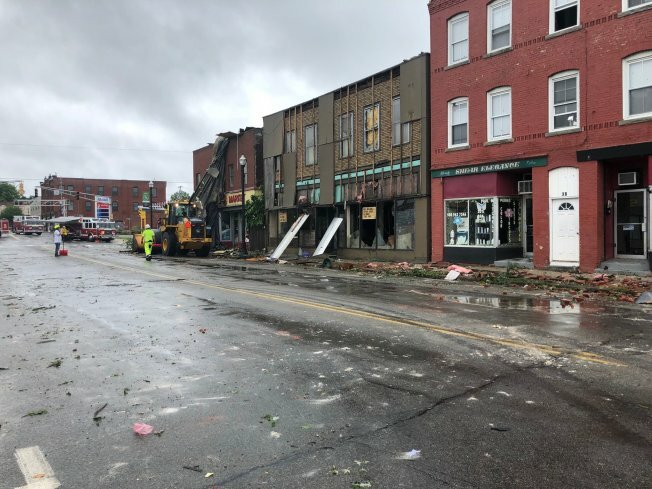 The thunderstorm that produced the Woodstock tornado went on to produce a substantially stronger tornado in Webster and Douglas, Mass where structural damage was observed in the center of town. This is the radar at the time of the tornado touchdown in Woodstock. The panels on the right show the strength of the low level rotation. This shows a rotating thunderstorm that was able to produce a tornado. On radar the strongest rotation was detected over Woodstock. In the upper right frame you can see radial velocity from the Boston National Weather Service radar detecting strong rotation. In the bottom right that rotation shows up as the brighter greens in the town of Woodstock. This is the morning weather balloon launch on Long Island which shows a couple things. An extremely moist atmosphere, some instability, and strong low level wind shear. These are the ingredients necessary for tornado development. This was a setup that was primed for an isolated tornado. 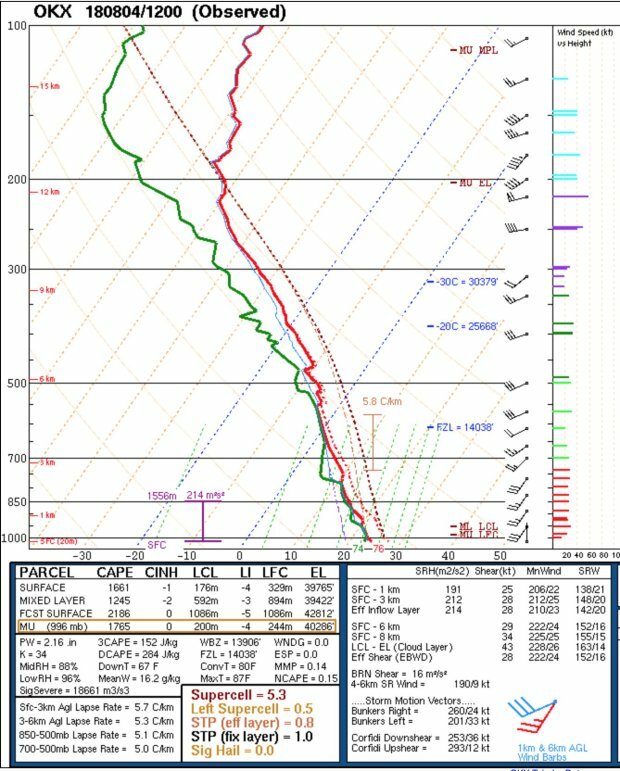 The morning weather balloon launch on Long Island detected strong low level wind shear. In fact the Storm Relative Helicity was approaching 200 m2/s2 in the lowest 1km which is an indication of how strong the low level wind shear was. This time of year any warm front or weak low moving over southern New England needs to be watched closely as the water temperatures over the Atlantic and Sound are extremely warm and there's typical ample instability to work with the enhanced wind shear near a front. This has been an extremely active severe weather season across New England with multiple rounds of dangerous storms. Hopefully we get a nice break soon!